Avachinsky volcano field station belongs to Volcanoes of Kamchatka Nature Park (UNESCO World Heritage site #765). 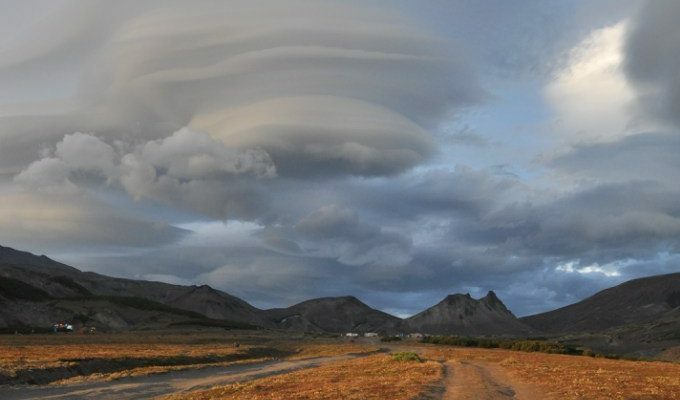 Avachinsky volcano field station is located in the Russian Far East, on the south of the Kamchatka peninsula near the main cities of the region – Petropavlovsk-Kamchatskiy and Yelizovo. Station is situated at an altitude of about 950 m on a saddle between Koryaksky and Avachinsky volcanoes (53˚15’35” N, 158˚44’26” E). Station is located on the forefront of Nalychevo Nature Park, which includes all study area and a large Nalychevo river valley over the volcanic ridge. Main landscape feature near the station is a valley of Sukhaya Elizovskaya river, a representative object for the rivers which are draining slopes of volcanoes in the region. The surrounding of field station are characterised by a large variety in landscape, floraThe plants that live in a particular region, habitat or time (such as geological period like the jurassic). For animals, we use the term fauna, and to collectively refer to all... More and faunaThe animals that live in a particular region, habitat or time (such as geological period like the jurassic). For plants, we use the term flora, and to collectively refer to all... More. Station is actually located in a shrub tundraA type of ecosystem in which tree growth is limited by low temperatures. The origin of the word is from from the Kildin Sami word tūndâr, meaning "uplands" or "treeless mountain tract". In the northern... More zone, and whole territory is representing different types of altitudinal zonation from forests to glaciers because of mountainous terrain. Both of surrounding volcanoes are occasionally active – Avachinsky’s last eruption occured in 2001, now the crater is covered by a lava neck with a heavy fumarole activity underneath it. Koryaksky volcano is dormant, but in 1956 and 2008 it was erupted with ash plumes and pyroclastic flows production. Between the volcanoes there is a Camel Rock extrusion, which is easy to visit by foot. The area features pyroclastic slopes, where stream sections expose stratified lapilli tuffs,deep gullies, and few small fumaroles. The fauna and vegetation within the surroundings of the station is typical for Kamchatka peninsula, one of a main species around the station is an arcticDefinitions of the Arctic vary according to environmental, geographical, political, cultural and scientific perspectives. Some scientists define the Arctic as areas having a high latitude, long winters, short, cool summers,... More ground squirrel, occasional charismatic species on the territory are bear, sable and lynx. In the rivers of Nalychevo valley a lot of salmon fish varies spawns. Describe the history of the station including year of establishment, facilities (max number of visitors, type of rooms, catering) and shops (in ca. 100 words). Nalychevo nature park is a part of a biggest protected area of Kamchatka peninsula – Nature park “Volcanoes of Kamchatka”. Nature park was established in 1995 after the decision of initiative, which was consisted of Kamchatka protect fund, Regional touristic club and local activists. Nature Park was included into UNESCO World Heritage List at the 20th session in 1996. Station has living rooms for 24 people and kitchen/living room. Tents can be placed both near the station and within study area. The research at Avachinsky volcano field station focuses on botany, ecologyThe study of living organisms in their environment, including where they are found and how they interact with their physical environment and with each other, for example through food webs.... More and zoology of the volcanic tundra zone. Last years the investigation of hydrologyThe study of water in the environment, particularly its amount, movement and quality. It encompasses water in rivers, lakes, glaciers, soil and underground aquifers. The way in which water (liquid and... More, hydrogeology, glaciologyThe study of glaciers., meteorologyThe scientific study of the atmosphere and its phenomena, especially in relation to weather and weather forecasting.... More, geomorphology and soil science has begun. As far as no long-term hydrological data is available for the rivers draining volcanoes, the main purpose of recent studies were field-based assessments of water and sediment discharges within the case study river with a length of about 25 km. The main aims are to study the stream formation in the ultra-unstable lahar deposits of the river valleys; supranival flow forming the channels on the snowpatches surfaces and the complex impact of the volcanic activity on the landscape; microclimate features of the territory in correlation with a different nature processes and glacierA glacier is a large, persistent body of land-based ice that forms over many years where the accumulation of snow is greater than its loss (ablation). The ice in a... More dynamics. Existing databases contain records on plants, biotaIn simple terms, this word is a collective term for all living things. To refer only to animals, we use the word fauna, and for plants, flora. See also 'biodiversity'.... More and vegetation-cover ecology, databases of hydrology and climateThe average weather we would expect over a long period of time (seasons, years, decades). Climate varies from place-to-place across the Earth. Climate is determined by long-term (over at least... More are developing. Avachinsky volcano research station is a gate to the Nalychevo river valley, which is a protected area with a bunch of different points of interest for all kind of tourism (ecological, alpine, flowering etc.). Natural reserve status protects the territory from the industry and uncontrolled visiting, but the abundance of fish in the rivers and proximity to the region’s capital attract poachers. Research station can be reached from nearby cities of Petropavlovsk-Kamchatskiy and Elizovo (60 and 30 km respectively, including 15 km of bad road, four-wheel drive vehicles are strongly recommended, in summer off-road buses are reaching station 2-3 times weekly). The nearest airport is Yelizovo (PKC) in 29 km, which is connected to Moscow and Far East cities by daily flights.